A while ago a friend and I were talking about Rice Krispies treat. I kind of really enjoy them. She told me that she loves them with Reese's Pieces in them. Ever since that conversation I have been wanting to make them. I had never had them with Reese's Pieces in them, but I love Reese's Pieces so I figured how could I go wrong? 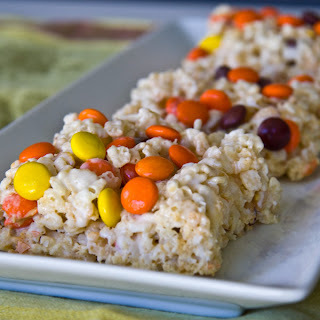 Well after making them I really can say they might be my new favorite way to have Rice Krispies! Melt butter in a large sauce pan over low heat (don't try and speed up this process they will turn out better if you stick with the low heat). Add marshmallows to the melted butter. Continue cooking over low heat until the marshmallows are completely melted. Add Rice Krispies cereal and stir until marshmallow/butter mixture is evenly distributed. Add the the Reese's Pieces and stir gently until they are evenly distributed. Pour into a greased 9X13 inch buttered pan. With a buttered spatula or a piece of wax paper gently press mixture down into the pan until it is fill the pan and is mostly flat on top. If you desire you can sprinkle more Reese's Pieces on top and gently push down on them to get them to stick. Allow to cool approximately 10 minutes then cut into desired size pieces with a buttered spoon. Enjoy! These look delicious. I am totally going to try them!